Let’s face it. While IT technologies have simplified our lives and streamlined our businesses, the systems themselves can be a challenge. There’s a lot that can go wrong – security, the network, systems updates, hardware, software, etc. To cope up with the changing business expectations and deadlines there has been an accelerated growth of IT infrastructure in enterprises and this has led to growth in heterogeneous IT environment within the enterprises. This has forced IT to remain always on the toes to meet the demands of business. To meet these demands the IT departments of the enterprises has to navigate through the emerging trends, adoption of new technologies, hiring new talent, upgrade the existing resource pool, mitigate risks, while adhering to security, compliance and ensure governance standards. Along with these rapid changes, in optimizing the IT infrastructure, companies face substantial challenges – scarcity of budget, tight resources, to reduce downtime, and improve productivity while lowering the total cost of ownership (TCO). The challenge is particularly acute for the small to mid-sized business, which doesn’t have the resources or a team of IT specialists to deal with every problem that arises. More frequently, when the system goes down, a call goes out to a repair tech, who may or may not be able to get to your problem right away… If he has the technical chops to solve it at all. 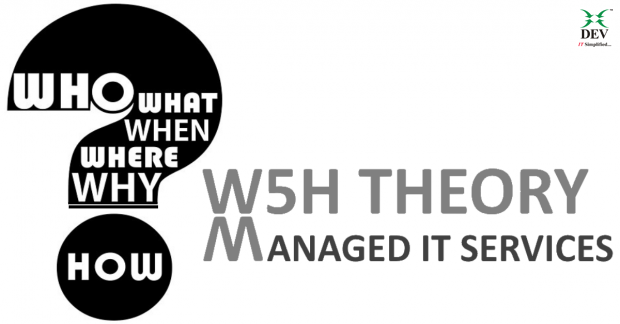 For businesses today to overcome these challenges, they need to evaluate W5H Theory for Managed IT Services. 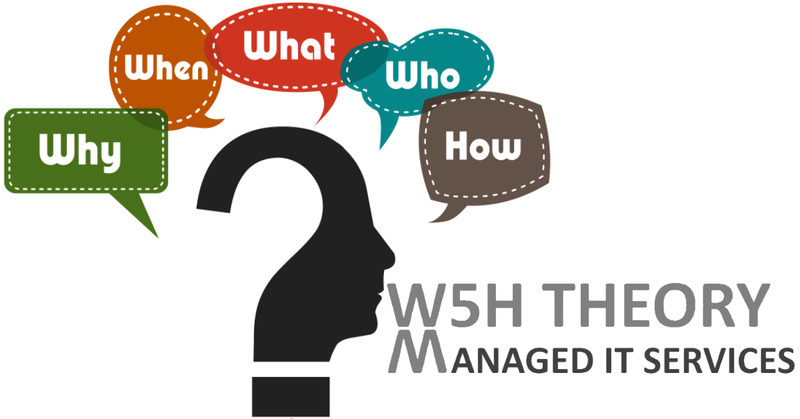 WHY do you require Managed IT Services? If your answer is mostly “no” to any of the below questions, you are utilizing a break-fix methodology to maintain your network. Without adding more costs to your monthly budgets, you can benefit from a managed service methodology. Do you receive immediate notifications if your data back-up fails to run? How do you keep an eye whether its successfully completed? Do you know which device on your network is approaching its end-of-life and might need replacing in the next 6 months? Do you know if your server and all of your desktops have the latest anti-virus updates and security patches installed and are functioning correctly? Do you know which users are using your internet heavily, and whether they are downloading large files which can slow down the network? Do you know which systems/services are hogging memory, affecting user performance? Do you have one number to call or a centralized helpdesk for all of your technology service requirements? Do your tech support guys only contact you “after” things break? Simply put, with Managed IT Services, your business gets 24/7 remote monitoring of your systems, and a team of technical support should things go awry. WHAT Managed IT Services do you require? To face the conflicting challenges companies demand a holistic approach for managed IT services. Managed Services allow a business to offload IT operations as it assumes an ongoing responsibility for 24-hour monitoring, managing and/or problem resolution for the IT systems within a business. Managed IT Services OR Remote Infrastructure Management services umbrella includes various services such as database management, security management, server management, network management, application management, desktop management, storage management, white labelled helpdesk services, etc. Starting from 24*7*365 days monitoring to ensuring 99.9% uptime for your IT services, from SLA-based streamlined processes (ITIL, CMMI, ISO) to high level automation for disaster management services. WHEN do you require Managed IT Services? There’s not a perfect time for Managed IT Services. You need support services any time of the day. Managed IT Services are available 24×7; so that you can enjoy your sleep and enjoy your vacations completely; without worrying of your IT. Another question that you might have is regarding the size of your business and IT. Am I too big for Managed Services? If you are a large corporate with a fully functional IT department, MSPs can function as an extended IT arm for all your day-to-day IT support needs. Am I too small for Managed Services? Even if you are small company with 2 desktops, Managed IT services can be opted for because of its flexible – pay per device per month model. Just like larger companies, small businesses also need technology to operate efficiently and to compete effectively. Simply put, it does not matter whether you are an MSME, SME, mid-sized or a large corporate. Managed IT Services are flexible and at the same time scalable to cater to any sized organization. Also talking of any foreseen event, incident, issue or catastrophe, it’s not a question of will it strike — IT’s WHEN. If you fall behind in keeping up with things such as backups, patches and security, the odds greatly increase that you’ll face an IT outage or another problem down the road that will negatively impact your business in terms of productivity and revenue. WHERE can Managed IT Services be delivered? Whether your devices (server, desktops, network devices, etc.) are at your office, data-center or home, Managed IT Services can be delivered anywhere, anytime. WHO will become a trusted Managed IT Services adviser for your company? If you’ve been in business for longer than 5 years, you’ve probably hired more than one IT support company — you’ve maybe hired many. You know the frustrations of having a new technician working with your network. The question becomes “Is your technician a trusted advisor” or just a guy trying to fix your IT system problems? HOW Managed IT Services can help your business? It’s cheaper. A small, understaffed IT department can often be more of a cost and burden than it’s worth. With managed IT support, you have a team of experts at your beck and call, without the expense of full-time salaries and benefits. It’s a predictable, monthly cost. No more unplanned repair bills. You pay for outcomes, i.e. a smoothly functioning system, rather than labour inputs – time spent on repairs. It manages the evolving complexities of technology. Managed IT provides you with a team of experts in multiple knowledge areas, enabling you to access the latest IT solutions at a cost you can afford. Managed service providers monitor your systems 24×7, watching for alerts and making fixes remotely, often before a problem arises. As a result of this “always-eyes-on” network monitoring 24 hours per day, businesses experience an additional level of comfort and security. Put in simple terms – one of the biggest benefits of Managed Services is spotting and fixing issues before they become major problems that can negatively affect your business. Managed IT Services help organizations to maximize performance, reduce security risks, and ensure availability, flexibility, scalability and compliance while effectively optimizing their IT infrastructure costs. ← How will Digital Marketers’ React to Facebook’s Reactions?